I focus on Hudson Bay for selfish reasons. The faster it thaws the better, as far as I’m concerned. As long as it has ice floating around on it there is a chance for some unseasonable cold to come south and spoil my summer, down here in New Hampshire. 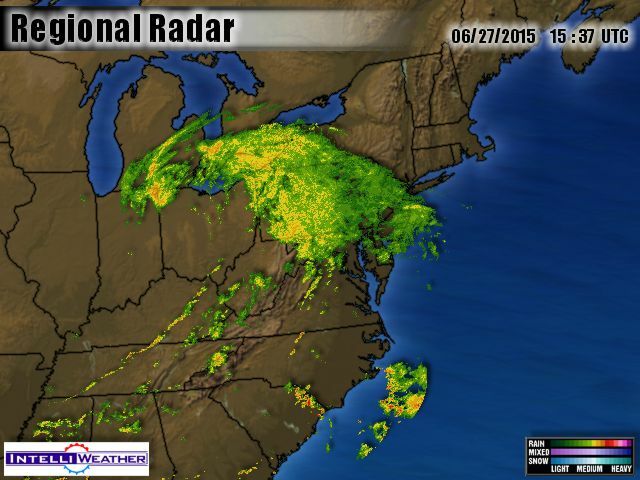 In fact it happened just last week, when a summer storm swirled up across the great lakes. Around the backside of that storm came north winds, drawing air down from Hudson Bay, and while the welcome rains began warm and summery, they gradually grew more and more chilly, until we experienced a daylight with temperatures never rising above 53° (12° Celsius) and a driving mist. That doesn’t count as summer, in my book. Other people look at sea ice for political reasons, and focus on this graph, which shows how swiftly the ice is melting. As you can see, two thirds of the ice melts every year. 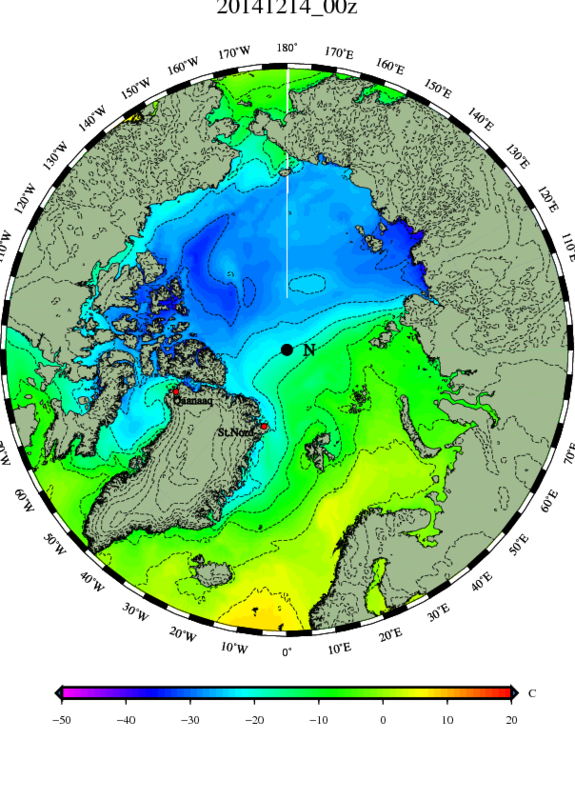 Almost always all the ice in Hudson Bay melts. If you are politically aligned with the Global Warming theory, you want the ice to be low, and to beat the lowest green line on the graph. In fact, you need it to, because otherwise your theory is humbug and you have to give all the money you took to combat-Global-Warming-with back to the people you stole taxed it from. 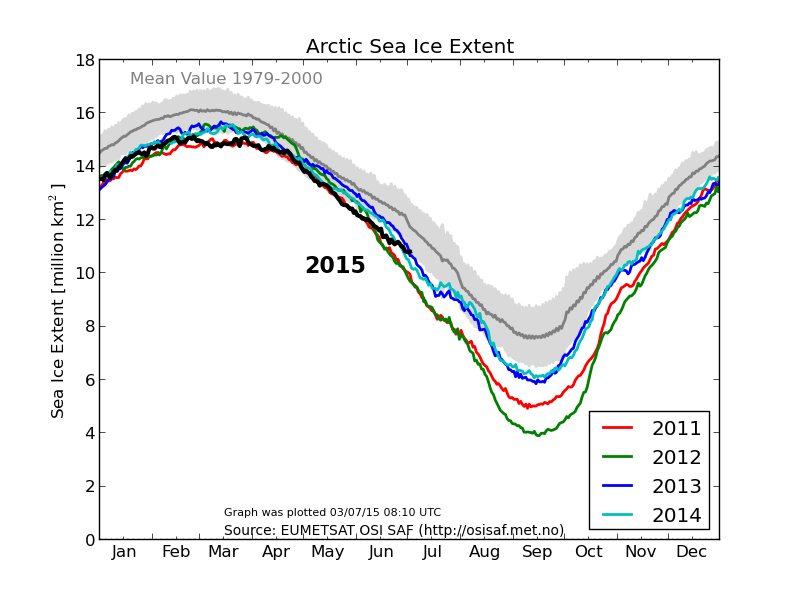 So here we are, in July of the next year, and once again the ice is failing to prove the theory. 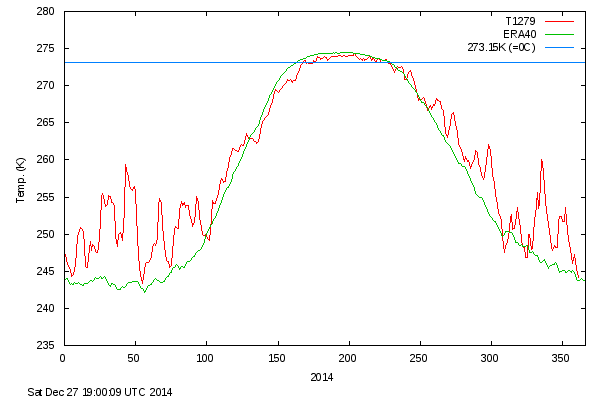 This is getting rather monotonous, but there are still some Alarmists who go “Ah ha! Ah ha!” if the graph ticks down, and cheer wildly if there is a steep fall. It is all much ado about nothing, as far as I’m concerned, as in many cases the ice is going to be gone by September in any case, and then grow back in December, but people seem to regard the graph as a sort of sporting event. Often I see a major misconception displayed by people who don’t know their ice. They think the north Pole is an icecap, when it is an ocean. 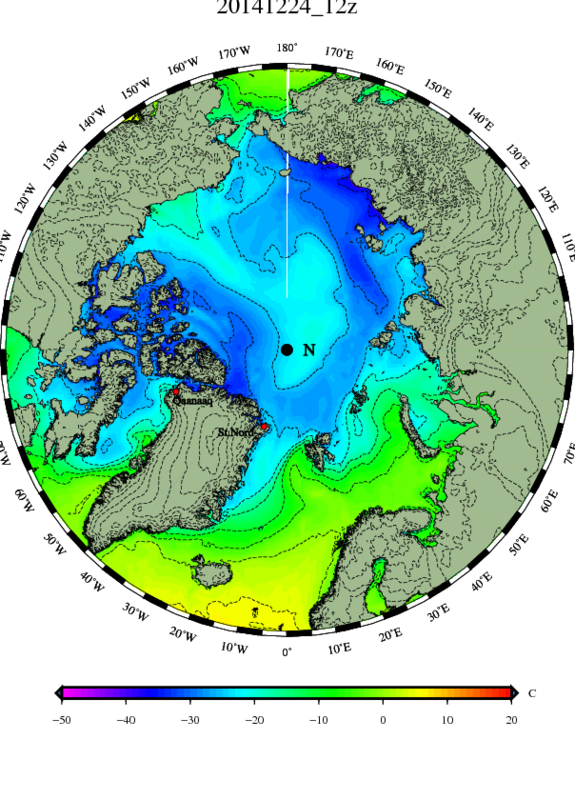 It is the Arctic Ocean, and the ice never sits still. In other posts we have followed buoys day by day as they’ve traveled over a thousand miles. One began near the North Pole and wound up on the north Coast of Iceland. One began on the north coast of the Canadian Archipelago, squeezed down into Nares Strait, traveled down the northwest coast of Greenland and then down Baffin Bay and wound up vanishing off the coast of Labrador. 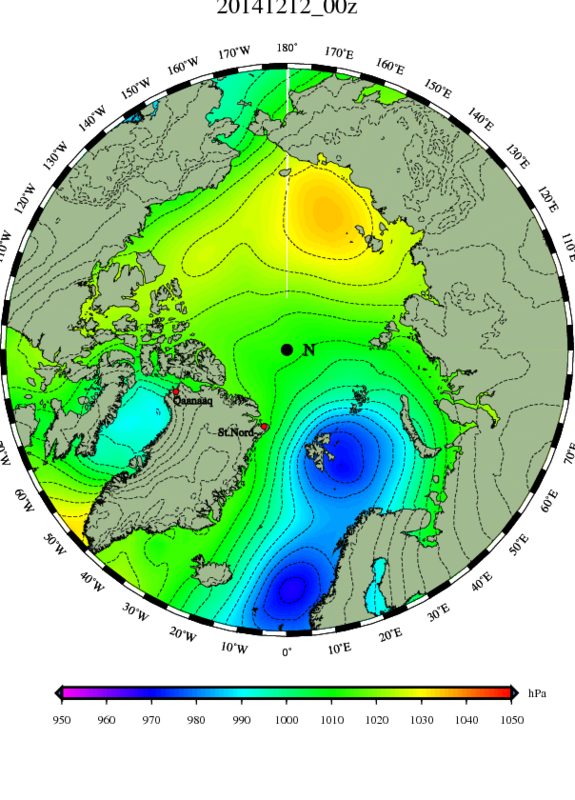 O-buoy 9, which we are currently following, began on the Eurasian side of the Pole, crossed near the Pole, and now is scooting along the north coast of Greenland on its way to Fram Strait. Nor is this a new phenomenon. During the Cold War in the 1950’s military bases floated around on “ice islands”, and in 1893 the arctic explorer Nansen attempted to drift across the Pole in a boat frozen into the ice called the “Fram”. Another misconception is that this motion only occurs during the summer, and that things are frozen fast in the winter. Even in the depths of winter the ice is in motion, and areas of open water can appear, many miles across, even when temperatures are -40°. When winds roar off cold tundra, the areas of open water along the shore, formed as the sea-ice is shoved out to sea, are called polynyas, and in places occur with regularity, for example along the shores of the Laptev Sea, or at the top of Baffin Bay. In such places the ice can be quite thin when spring comes, as it has had to reform at the very end of the winter, and it may be swift to melt. In other places, where all the ice has been blown, for example along the coast of the Canadian Archipelago and northern Greenland, the ice can pile up into a towering jumble. When we look at the ice we see it terms of thickness, and concentration. 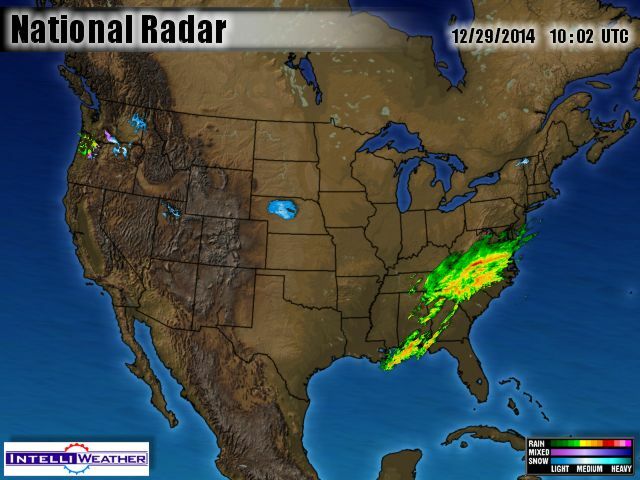 The map below shows concentration today. What is notable in the above map is the lack of open water in places where you might expect it on July 4, notably the Laptev Sea, Baffin Bay, and Hudson Bay. I’m focusing on Hudson Bay for the reason I gave earlier. 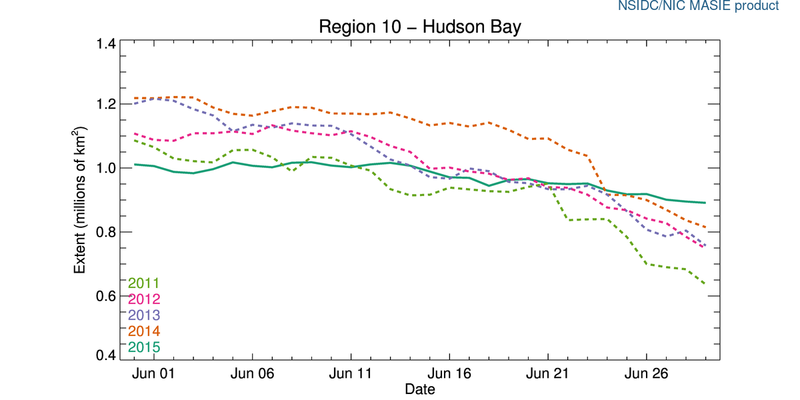 Hudson Bay started June with less ice than recent years, which made Alarmists happy, but now it has more ice than recent years, which likely has Alarmists glum. It has me glum because, as long as there is ice floating on that bay, it can generate sub-freezing temperatures under clear skies during the short nights. (Pink is below freezing in the map below; ignore the glitch that makes that mess along the left margin). 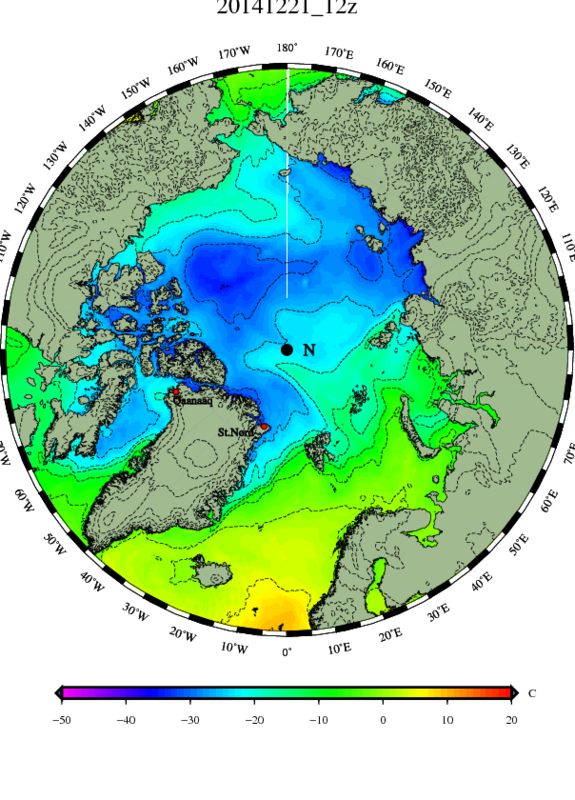 As soon as Hudson Bay is ice-free, it will stop creating that threat to my north, and my tomato plants will breathe a sigh of relief. In the meantime, I keep an eye on the bay using the Canadian Ice Service map. 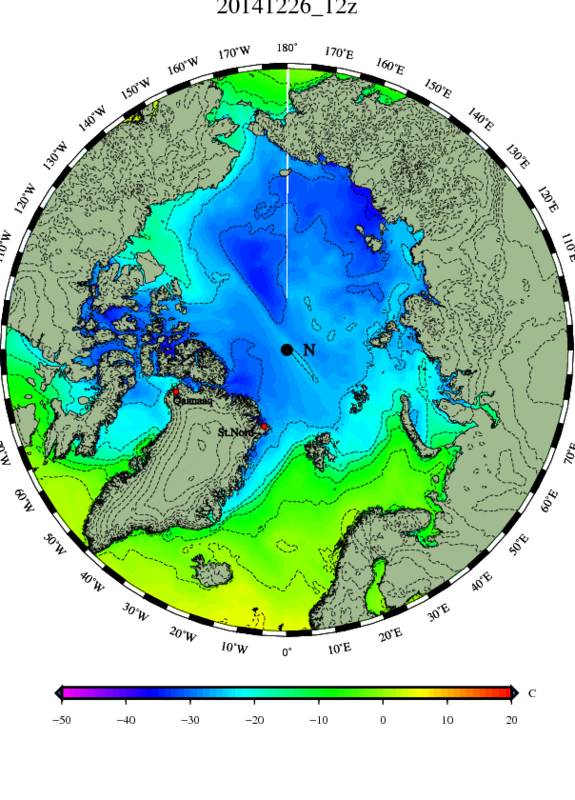 What is odd to some viewers is that the ice melted in the cold north part of the Bay before it melted in the warm south. This occurred because the wind howled down from the northwest a lot last winter, forming polynyas along the northwest coast, and cramming all the ice down to the southeast. Therefore one can see that not even in an enclosed bay does the ice sit still, in the arctic. I’ll be watching the ice carefully because on some rare years it fails to melt away completely. That would be a bad start to our winter, as by September the bay is usually warm enough to warm the arctic blasts coming down towards us. 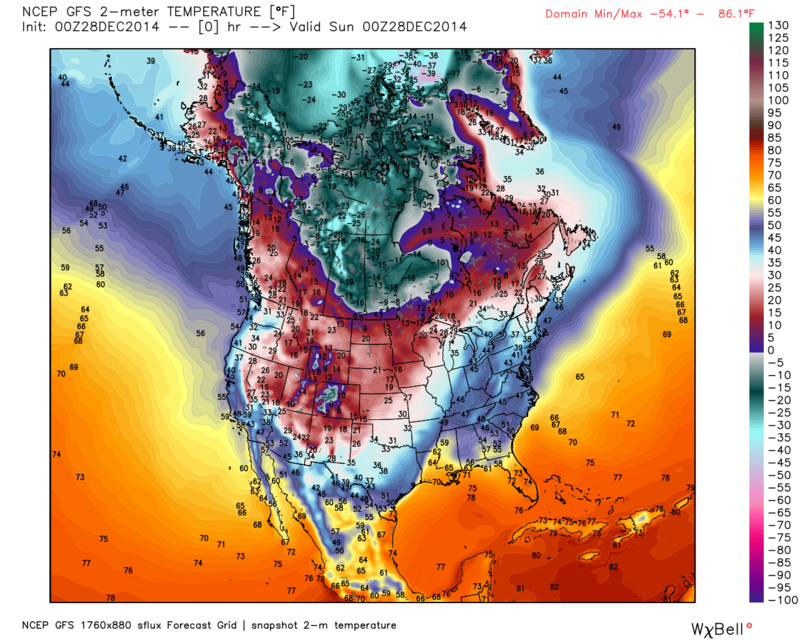 If it starts partly frozen and freezes early, we could have January cold waves in December. So you see, when I watch the ice there is a practical side to it. I’m not trying to make some political point, and not tempted to make things sound more dramatic than they are in order to gain more attention and money. This brings me to why I prefer the Canadian Ice Service, (within limits.) Other ways of “seeing” the extent of the ice have some major flaws, and show water as “ice free” when it most definitely isn’t. 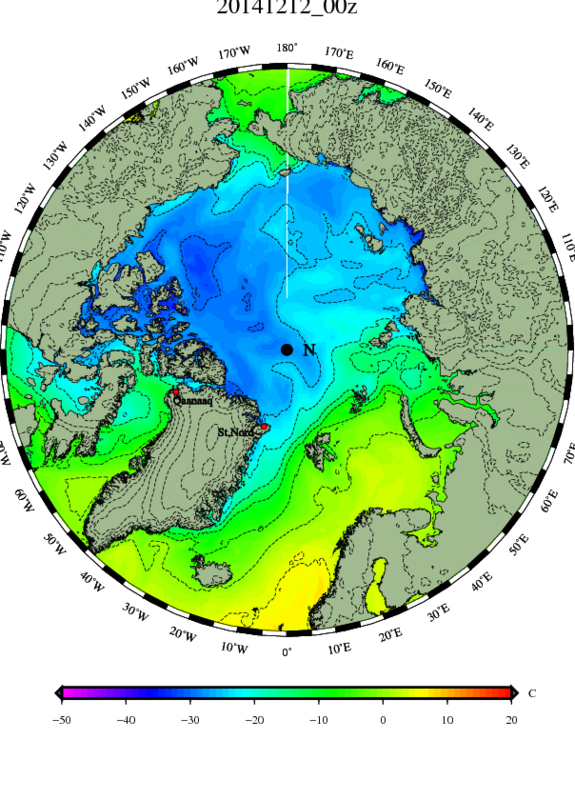 A major flaw involves using microwave imagery from space, the problem being a melt-water pool may be seen as open water. This problem was highlighted in a somewhat humorous way by polar bear researchers who pestered poor bears by drugging them and attaching GPS thingies behind their ears, so they could be tracked. The bears do 67% of their hunting and eating between the time the arctic sun comes up and the time the ice melts away, which in Hudson Bay is between April 1 and July 1, usually. Then they waddle ashore fat and happy, and then do 33% of the rest of their eating in remaining 75% of the year. 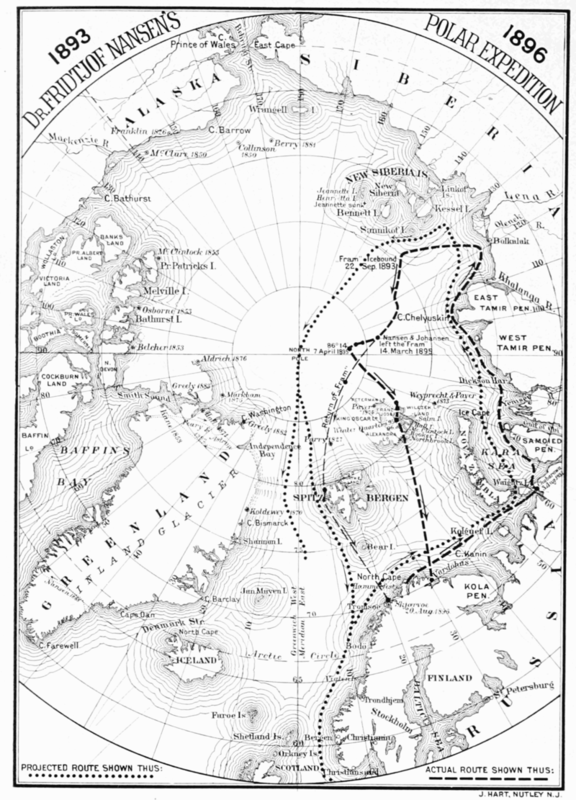 However, as the bears were tracked, it was noted that they spent a lot of time in areas that some maps showed were “ice-free”. 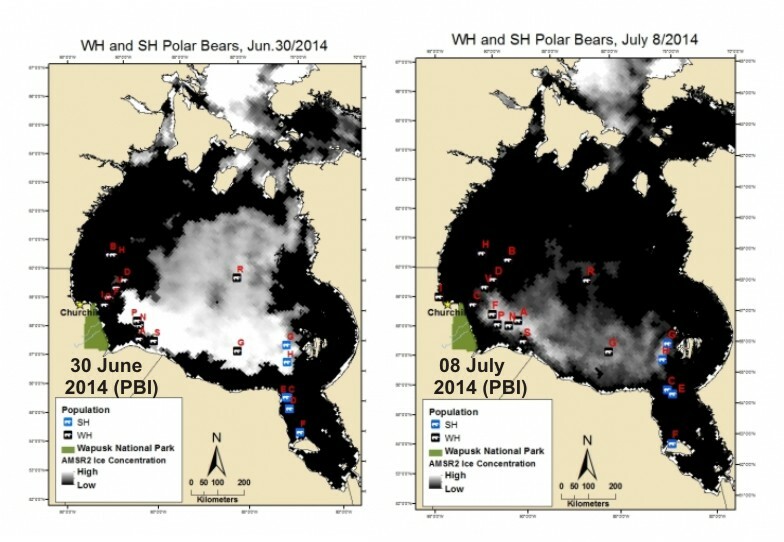 The maps below (From polarbearscience.com ) show the locations of bears last year, with some in “ice-free” waters. As for me, I’m glad I only do this as a hobby, and as a way of making a guess if next winter will start out cold or not. This is just an observation, because sometimes even a simpleton’s observation can trigger entire chains of thought in better minds. 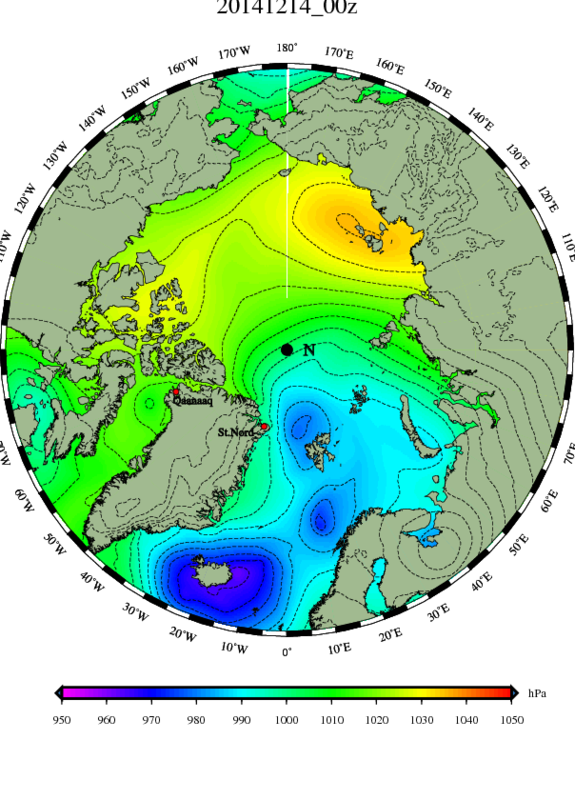 Europe’s weather has almost no effect on weather here in New Hampshire, as Europe is “down stream.” My interest is mostly in how Europe’s weather is effecting the weather north of Scandinavia in Barents Sea, due to my hobby of studying sea-ice. However I did live in Scotland for nearly a year, so perhaps I have a few fond memories that increase my interest, and cause me to focus more than I would if I were sensible. One thing I’ve focused on is how our warm air masses head across the Atlantic, sometimes fueling huge gales and hardship, and sometimes arriving in Europe as benign northern arms of the Azores high, begiling and enchanting northern lands with southern warmth. 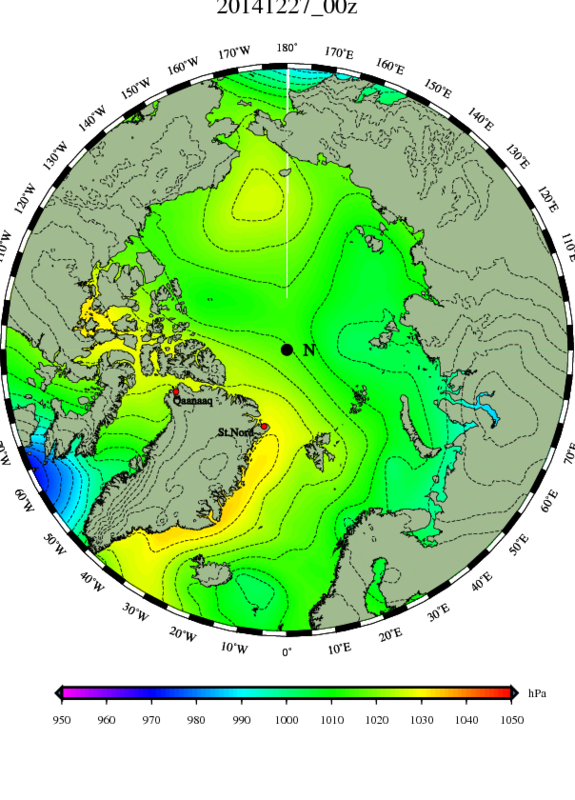 Last winter North America was so cold much warmth was shunted off shore and headed north to aid Europe. It was like the good old days, when America could afford to be generous. 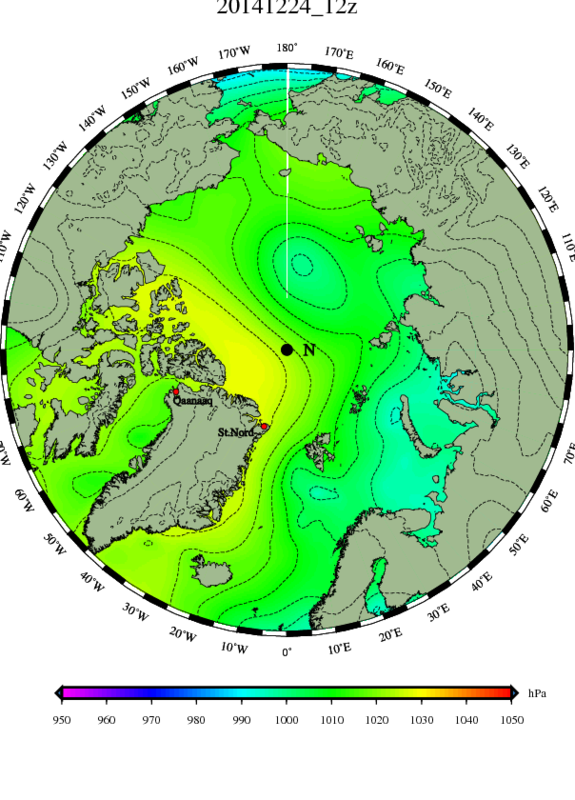 Europe hardly had a winter, so much mildness poured over it on southwest winds. Now, however, perhaps America is bankrupt and shrunken, for even when we send our warmth northeast, it seems pirates rob the freighters of air before they get to Europe. Our promises are reduced to those made with a forked tongue. 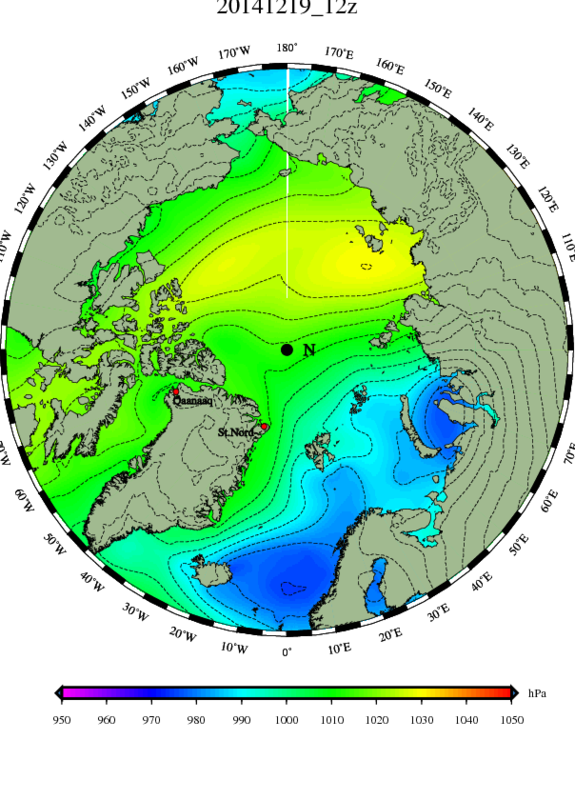 I became aware of this keenly, quite recently, after I had decided the past cold spell had ended in Europe, and England was being rescued by warm west winds, but then read a blogger describe how the west winds held snow, at a rate of an inch an hour. This was so utterly different from last year I sought a cause. Of course, I can’t describe the cause in terms a scientist would think much of. However, as a layman, I can state there certainly is a thing-in-the-way. Something is causing the nice, mild flow of air we send to Europe to fork like a snake’s tongue. Where it flooded straight ahead last year, this year it either turns left towards the top of Greenland, or turns right to head through the Mediterranean, or, if plows straight ahead, gets occluded, in which case the warm air is to high up to do those on the ground much good. Last year I described Siberian air as “the snout of Igor”. This year it as if that snout has kept nosing west, then flinching back, but then nosing further west, before flinching back not-as-far. It is a repetitive, progressively westward sort of snouting. It doesn’t take a nice, neat form, as a high pressure, though sometimes it builds a high pressure. Rather it is just a cold, sinister, east wind. I’ll leave it to larger minds to fathom it all, and to study the differences between last year and this year, and explain it to fools like myself. 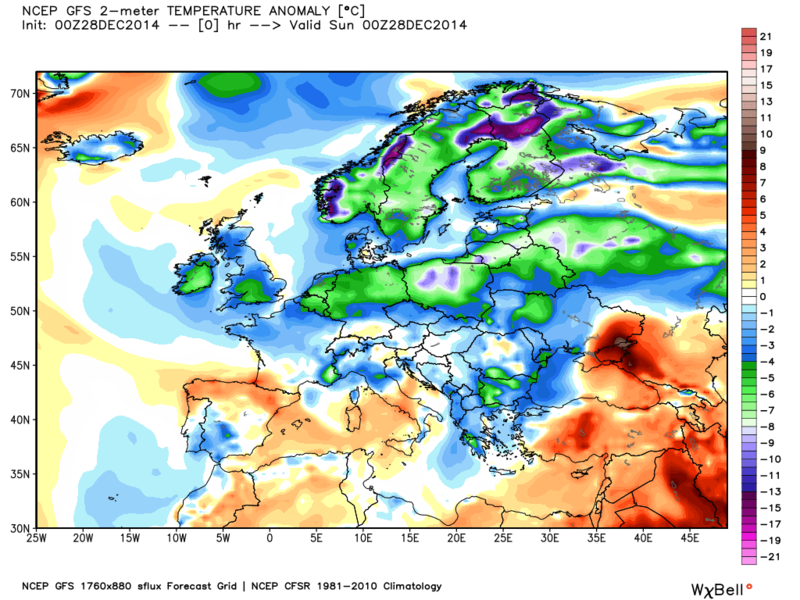 I’ll just give you a series of UK Met maps,showing how the nice warm air we send to Sweden never gets there. 24 hours later we’ve only impressed the babes of Ireland. At least we can look west. and see two more lows crossing the Atlantic, bringing reinforcements of mild air. After 72 hours we are wondering “What the heck is going on?” The warm air that wooed Paris is now a shrunken warm sector by the Black Sea, and all the warmth of our first reinforcement is occluded aloft as it approaches Norway. 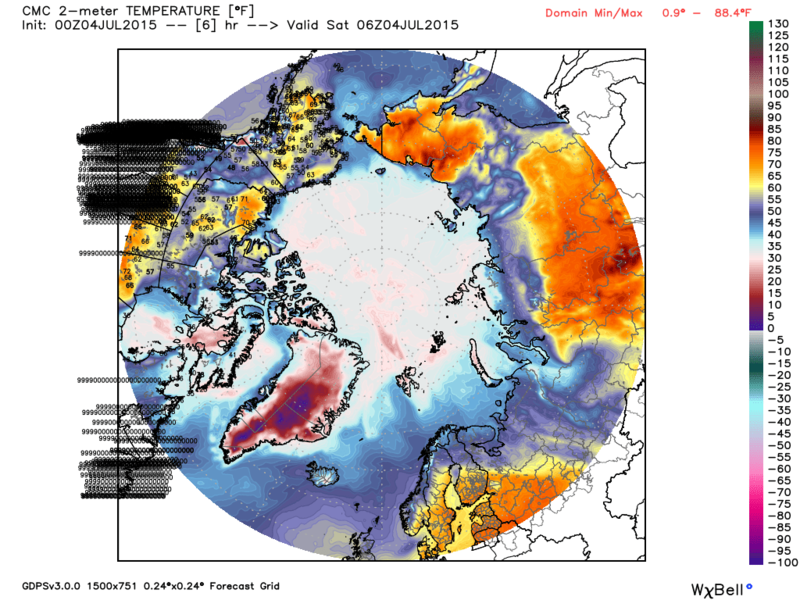 (Please remember last year warm fronts surged right over Scandinavia with little trouble.) However at least we have our second reinforcement approaching Ireland. After 96 hours we are definitely discouraged. Though we did manage to again get a warm front into Paris, the Swedes are laughing at us, as we never get there. 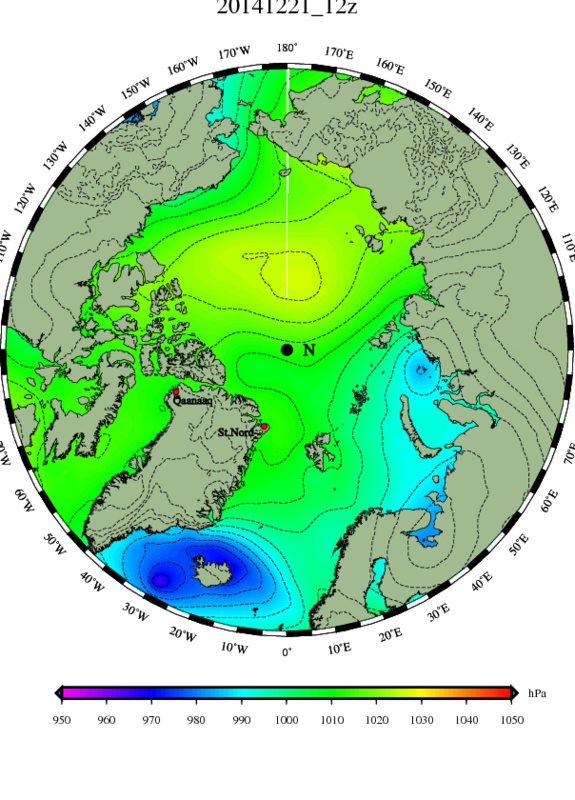 Furthermore, winds are turning north in the north of Sweden. Our rivals the Russians are coming! By 120 hours all our attempts to warm Europe are a shambles. A fragment of a warm sector is over the Black Sea, but all other warmth has been occluded and is aloft. The Atlantic air over Europe is not from the Azores, but from Baffin Bay and Greenland. And Siberian air is starting to swoop around the north side of the low east of Finland. How did that low get there, anyway? Last year lows charged up over Scandinavia and continued on, at least in part, along the Siberian coast, east all the way to the Bering Strait. This year they have no identity, and form and reform into a ill-defined shape that sags southeast, and allows Siberian cold to come west over the north side. 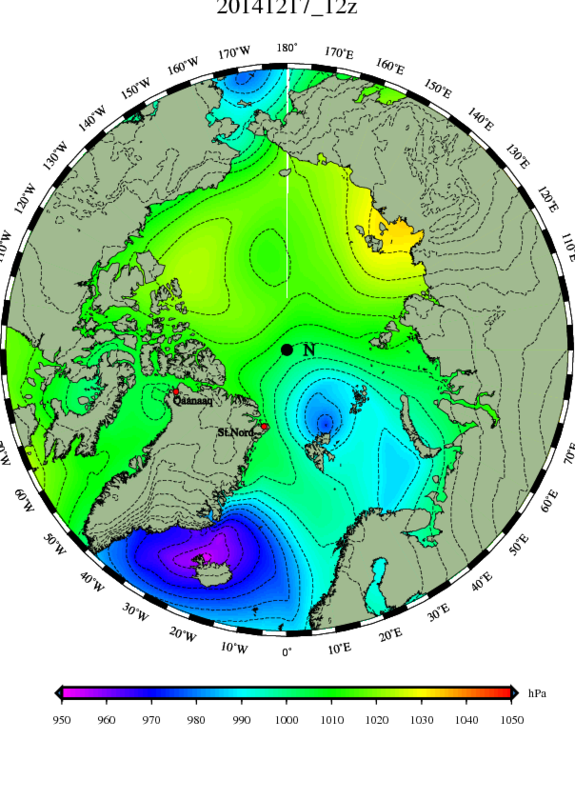 Last year the maps always seemed to show southwest winds over Scandinavia. This years map shows winds swinging to the northeast. An invisible shape is forking what was a straight flow. That is my observation. You figure out the details. 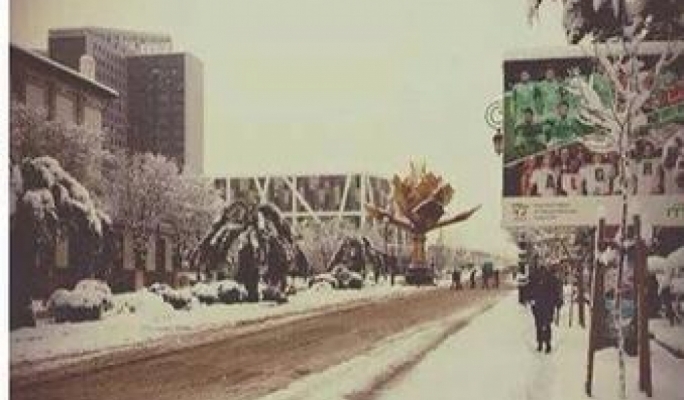 I am always interested in snow and cold getting across the warm Mediterranean to North Africa, as my over-active imagination likes to create a blooming Sahara. Apparently there were reports of snowflakes in the air on the island of Malta, right out in the Mediterranean, which would have been a first. The Malta weather bureau couldn’t confirm it. Here’s a brief video of snow in Palermo. 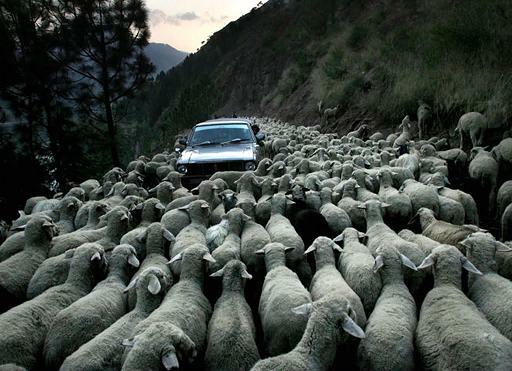 For some reason pictures from this video which appeared around the web have vanished. Likely it is some copyright fuss. 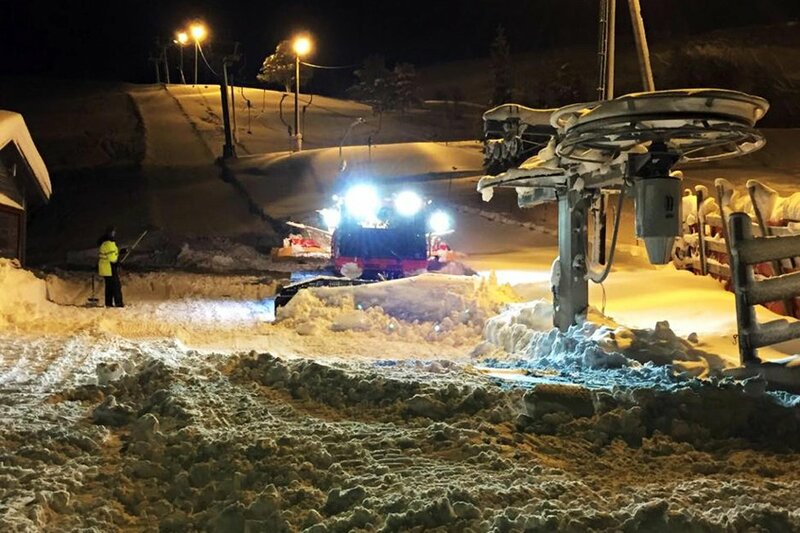 Even up in Scandinavia, where the milder Atlantic air came in from the west, it was cold enough to cause so much snow they had to plow the slopes to keep skiers from getting caught up in the workings of the lifts and ground into hamburger. The mild air over Scandinavia brewed up a sizable gale up there, but now that gale is sliding east, and absorbing a lesser storm to its west, and it looks like that, behind the two storms, a northerly flow will come down over Europe tomorrow. What is interesting is that it is almost immediately followed by a southerly flow as the next Atlantic storm moves in from the west. These back and forth surges of air have been interesting to watch. The computer models can’t seem to handle them very well beyond a few days into the future, for some reason. If it does get above freezing in Svalbard, it will be warmer there, well north of the Arctic Circle, than where Arabs ride camels under date palms. 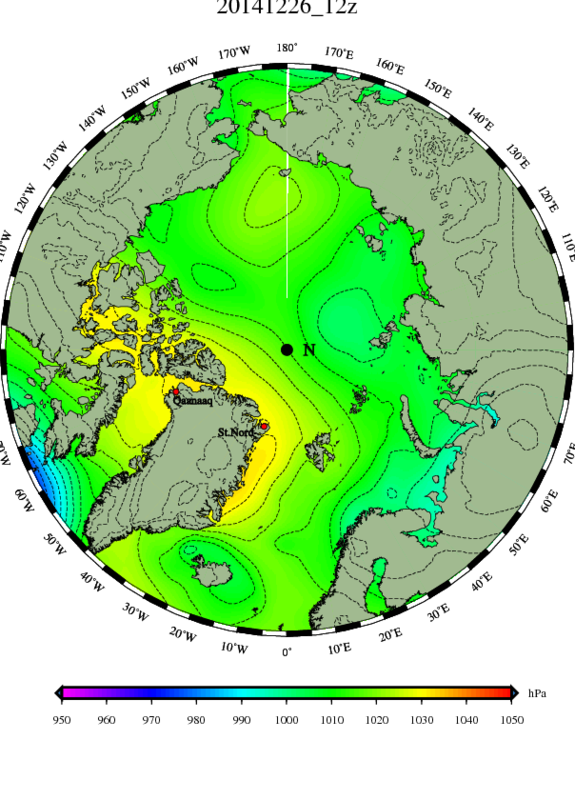 That just shows you how amazingly topsy-turvy and loopy a “meridianal flow” can get, in Europe and western Asia. The Christmas break is about over, in terms of brutal weather. You can tell the north is up to no good when the isobars are straight north-south all the way from high pressure in the the Canadian Rockies to low pressure east of Greenland. When these surges of cold come south you look for a storm to brew up, but the storm south of us looks like it is being swept right out to sea before the cold air can catch up to it, and turn it into a blizzard. There is too much of a gap between the first cool front, with polar air behind it, and the second that indicates the arrival of the truly arctic air. It would be fine with me if all the storms stayed south of here, and we just saw the lakes freeze up and make for good skating. The ski areas wouldn’t be happy, but maybe we could arrange for some flurries in the higher hills. I’m not sure why I’m looking at Europe. I should pay attention to what is in front of my nose, which is a opportunity created by an open winter. The last of the Thanksgiving snowstorm has melted away, and the forest floor has gone from white snows to being leafy and brown. I could use a spell with the woods staying snow-free, to get a bit of firewood out. We’ve used up more than I planned on, with the kids home and a baby in the house. Also I don’t need the work of snow-removal, for I’m feeling in the mood to write outside of this blog, and it is making me restless. If I disappear it will be because I’ve taken a time machine back to the early 1970’s, as that is what I want to write about. Cabin fever, though the woods are snowless. Cabin fever, though the days are fair. Wise with time. 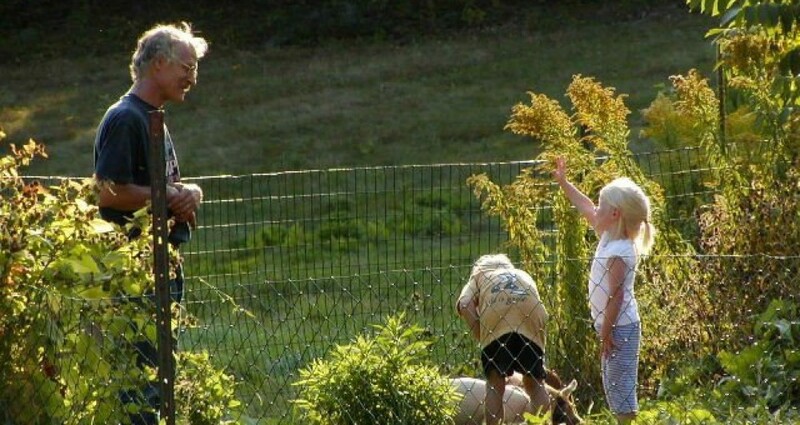 Age makes me unaware. And longs to grip ropes and set winter sails. Paces past eye-windows of discontent. And hush, and wonder where a lifetime went. “What’s the point?” The answer is grim and clear. Beethoven wrote best when he couldn’t hear.